There are plenty of beautiful scenic places to park your camper while traveling in Kluane National Park in the Yukon Territory in Canada. Kluane Lake reflects a mirror image of the surrounding hillsides, clouds and trees. 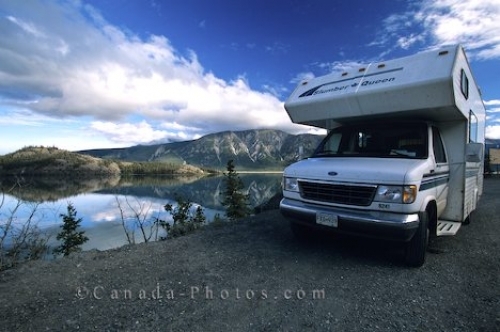 An RV Camper beside Kluane Lake, Kluane National Park, Yukon Territory, Canada. Picture of a camper parked along the shores of Kluane Lake in the Yukon Territory in Canada.